Below is the official TOVP Invitation flyer for the Chakra installation ceremony on February 7th, 2018. You may print it for your temple and post it on the internet as you wish to help get the word out. This historic and momentous occasion is probably one of the most important in ISKCON’s history. 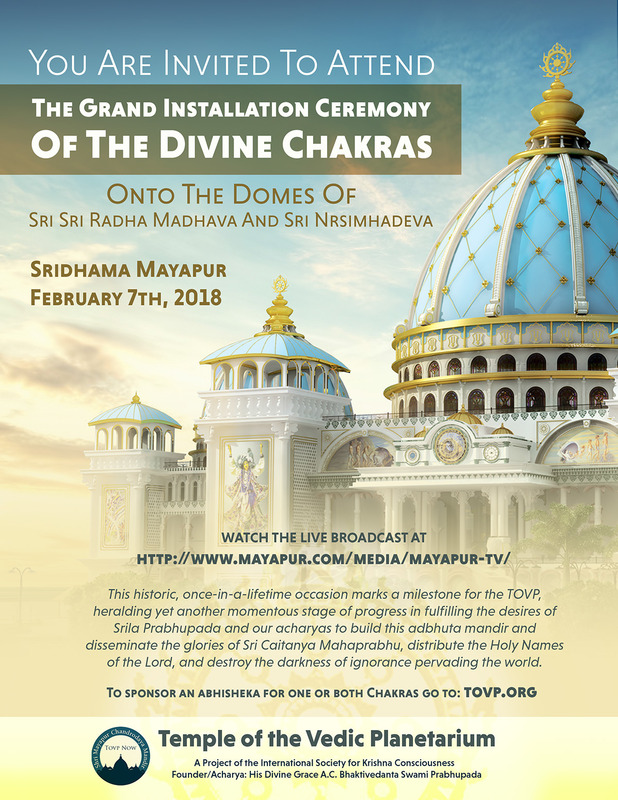 It heralds yet another milestone of achievement in our progress towards the fulfillment of Srila Prabhupada’s deepest desire to build the Temple of the Vedic Planetarium and establish Sridhama Mayapur as the spiritual capital of the world from where the distribution of Krishna prema emanates and the Yuga Dharma of Harinama samkirtan began. And it represents the end of a phase and the beginning of a new phase of construction as we march towards the Grand Opening ceremony of the TOVP in 2022.